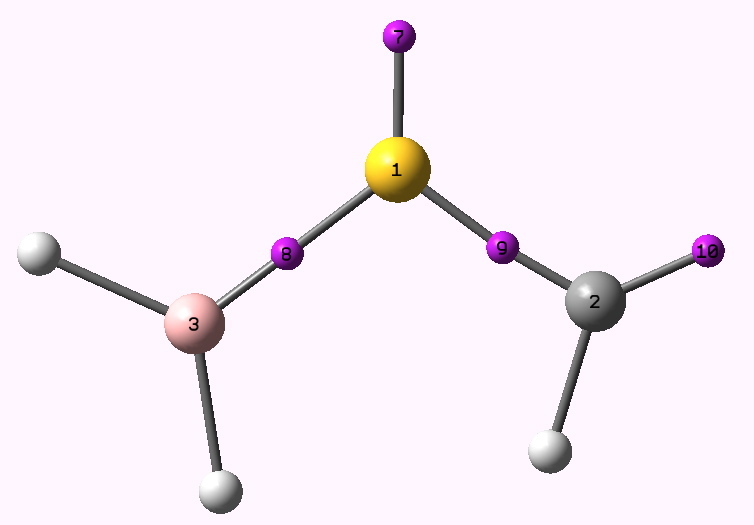 The nature of the C≡S triple bond: part 3. In the previous two posts, a strategy for tuning the nature of the CS bond in the molecule HO-S≡C-H was developed, based largely on the lone pair of electrons identified on the carbon atom. By replacing the HO group by one with greater σ-electron withdrawing propensity, the stereo-electronic effect between the O-S bond and the carbon lone pair was enhanced, and in the process, the SC bond was strengthened. It is time to do a control experiment in the other direction. Now, the HO-S group is replaced by a H2B-S group. The B-S bond, boron being very much less electronegative than oxygen, should be a very poor σ-acceptor. In addition, whereas oxygen was a π-electron donor (acting to strengthen the S=C region), boron is a π-acceptor, and will also act in the opposite direction. So now, this group should serve to weaken the S-C bond. The H2BSCH molecule. Click for 3D. At the B3LYP/cc-pVTZ level (DOI: 10042/to-3189), the S-C bond now emerges as 1.834Å compared to 1.544Å for the HO-substituted version and the S-C stretch is reduced to 803 cm-1. The NBO interaction term between LP(1)C2 and BD*(1) S1-B3 is indeed quite small (6.9 kcal/mol). The basin integration for point 10 increases to 2.22e, whilst point 9 decreases to 1.90e, and 8 is again up at 2.11. The SC bond is now merely a single bond! So what have we proved? Well, we find that our hypothesis works in both directions, to either strengthen or weaken the CS region. Indeed, variation of the S-substituent (HO, OTf, BH2) has quite a dramatic effect on the nature of the CS bond, evolving it all the way from a single bond at one extreme to one with significantly triple character at the other. This entry was posted on Sunday, December 6th, 2009 at 11:56 am and is filed under Hypervalency, Interesting chemistry. You can follow any responses to this entry through the RSS 2.0 feed. You can leave a response, or trackback from your own site.